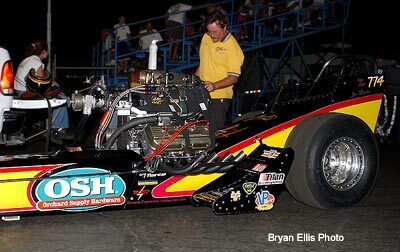 Nearing midnight on Saturday and after much drama, Jim Murphy took the win over Bill Dunlap on a holeshot in the quickest side by side Nostalgia Top Fuel race in history. 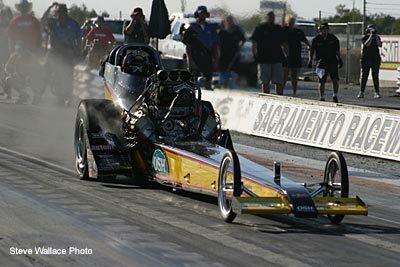 Murphy's 5.83 @ 239 narrowly beat Dunlap's quicker 5.81 @ 245. 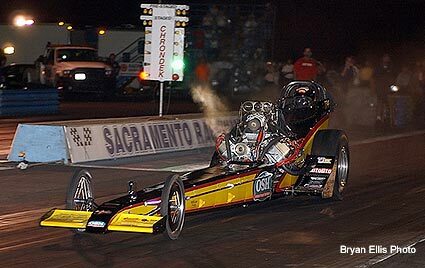 It was a thrilling cap on the most prestigious race annually held at Sacramento Raceway - an event Murphy has now won five times in his career. 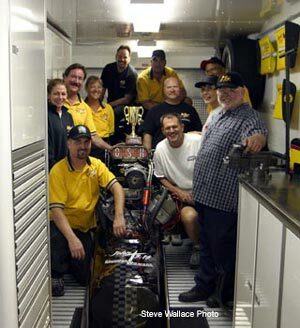 Due to the late hour the traditional "winners circle" shot in front of the tower was canceled and this impromptu gathering was staged in the OSH-WW2 Racing trailer. The "Governors Cup" sits atop the engine. 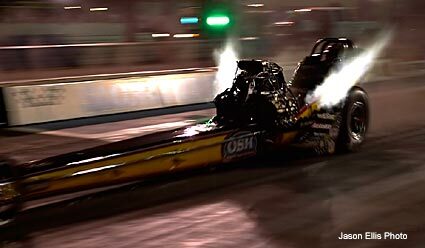 What turned out to be a excellent weekend for Murphy and the OSH-WW2 Racing team started with this "easy" 6.07 (at just 197) run during the first qualifying session on Friday evening. 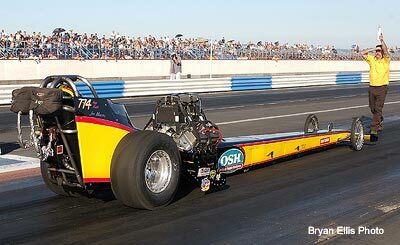 Later Friday night, the second qualifying session saw Murphy go low with the only "five" of the day with another easy pass of 5.92 with a shut off early speed of just 207. 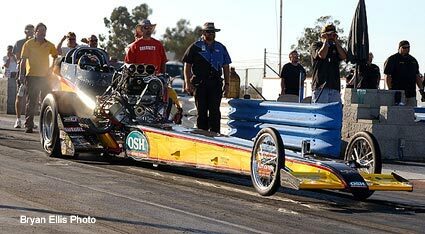 This locked the # 1 spot and gave the team a tune up for race day. In Round One Saturday evening Murphy was paired with the always tough Howard Haight. 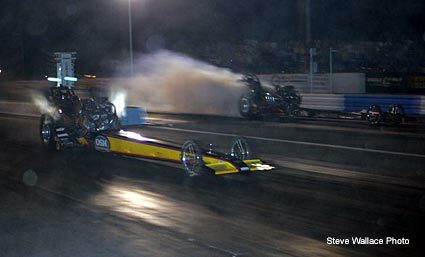 Barry Byrne guides Murphy into his tracks after the burnout. 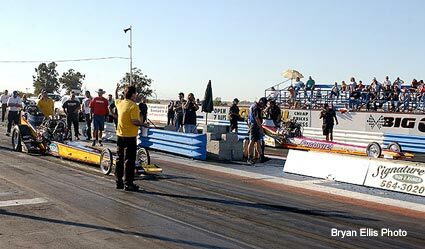 After this staging shot, both cars left the starting line together but the race was over early and Murphy streaked to a stellar 5.91 @ 247. 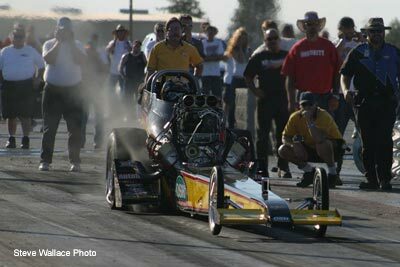 Haight smoked the tires and shut it off clocking a coasting 9.08 at 94 MPH. Here's a nice three shot sequence showing how hard the OSH fueler left the starting line against Haight. 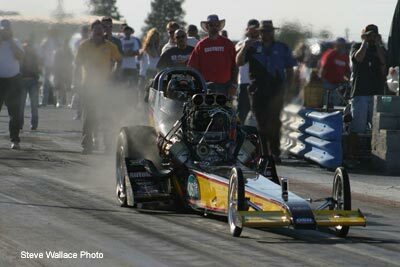 In the semi finals Murphy faced the potent Chevy powered car of Lee Jennings Sr. Jennings who was back on the break rule for Denver Schutz. 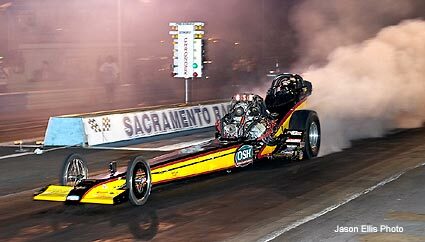 Jennings ran a very strong 6.023 @ 240.56 in his first round loss to Bill Dunlap so the OSH team couldn't take him lightly. 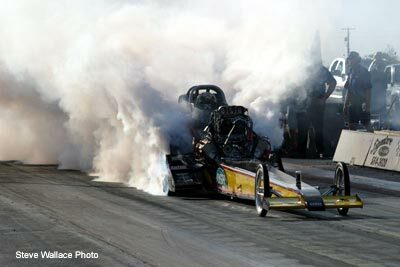 Murphy heats up the tires for round two. Murphy was out first as Jennings blazed the tires at the hit. 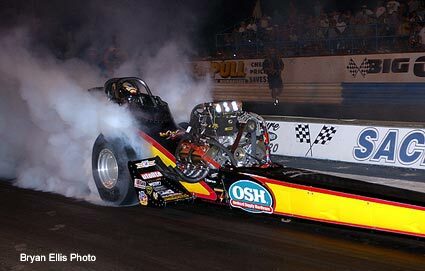 Jim went on to a shut off early 6.033 @ 205.81. 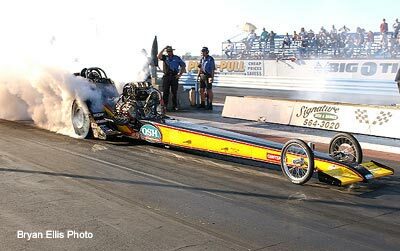 The final was filled with drama and promised to be a good one if the repairs on the Dunlap & Fuller car were done correctly. 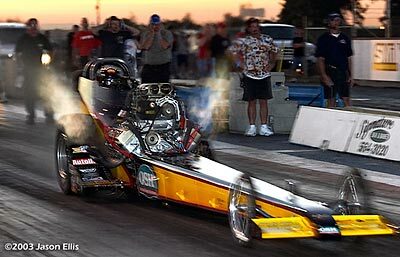 In the semi finals Bill Dunlap won his race but had a major engine explosion at the end. The car slid sideways and finally tipped over on its side without touching a guardrail. The car sustained a lot of damage but was repairable. With the help of other racers they got the car back together but ran out of time to even start it before coming to the line against Murphy. 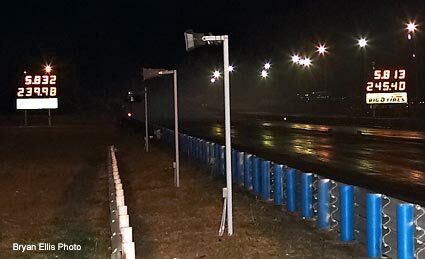 In a show a sportsmanship, Murphy and the OSH-WW2 Racing crew gave the Fuller team extra time to make the call as they wanted to race for the title and not make a single run for the win. 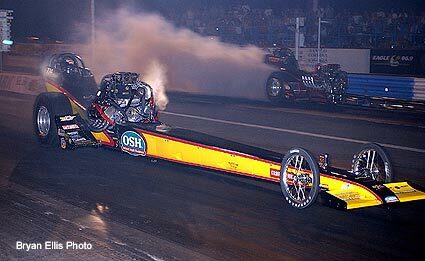 The OSH fueler sounded very strong on the burnout. The race itself turned out to be one for the record books. 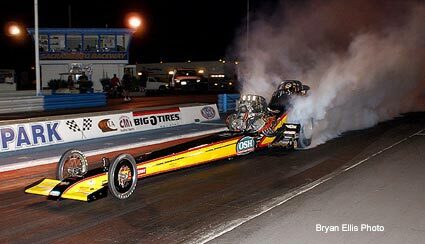 Both cars left the starting line extremely hard with the reaction time advantage (holeshot) going to Murphy (0.507 to a 0.578). 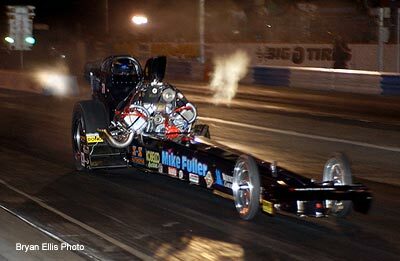 As it turned out that would be the difference in the race as to everyone's surprise the Dunlap & Fuller car ran a career best of 5.81 @ 245. 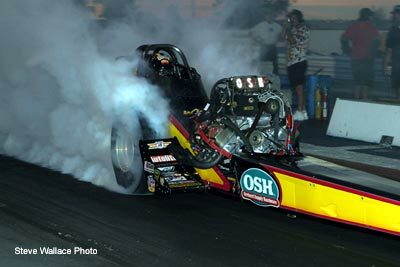 Winning by less than three feet, Murphy carded a stellar 5.83 @ 239. He won this one on the starting line! What an incredible finish to a great event. 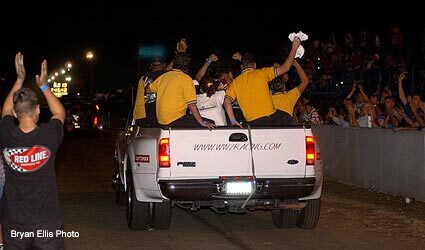 The crew celebrates as they toss some of the very popular OSH-WW2 Racing T-shirts to the screaming fans.